51 Buffalo shot and left to rot without even a “by-your-leave”. Yahoo! It’s all just part of the cattlemen’s culture – the so-called “Code of the West”. Read the full article and find out how cattlemen deal with errant cows. Whole ‘notha ballgame! Traditionally Native Americans prayed over slain Buffalo, honoring their sacrifice to the tribe. They used every part of the animal. They even ate their still-beating hearts to gain the Buffalo’s strength, wisdom, and courage. They believed if they failed to follow these traditions, the Buffalo would put a curse on them and their whole tribe. Don’t imagine their were any prayers from the cattleman or his ranch hands. They slaughtered these animals and left them to rot with no respect for their lives. They have no honor. May the Buffalo curse you and your “tribes”! 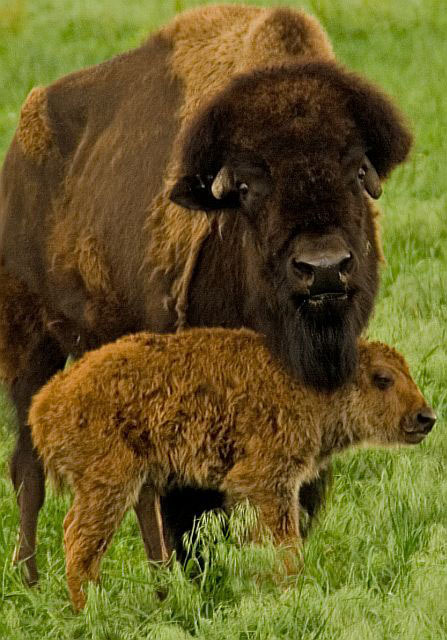 It’s my understanding buffalo and pronghorned antelope are the only two cloven-hooved species indigenous to North America. Are either of these “wildlife” species protected? If so, where and under which government agency? “Beefalo” – cow/buffalo crossbreeds are in a whole different category, but they don’t look as impressive stuffed and hanging on a trophy-hunter’s wall. To those without respect and honor – whenever you suffer disaster or misfortune you might want to remember the curse of the Buffalo!